Coach Luke Walton and the Lakers were unable to slow opponents in transition last season. NBA.com's John Schuhmann gets you ready for the 2017-18 season with a key stat for each team in the league and shows you why it matters. Today, we look at the Los Angeles Lakers, who didn't get back on defense often enough. Last season's Los Angeles Lakers allowed 19.6 points per game in transition, the highest mark in the league. Good defense starts in transition, because league-wide effective field goal percentage drops from 60 percent in the first six seconds of the shot clock to 50 percent thereafter. If you can get back, prevent those early shots, and make your opponent play in the half court, you're in decent shape defensively. After three rough years under Byron Scott, the Lakers brought in the guy who had coached the league's No. 2 defense over the first 43 games the season before. But Luke Walton couldn't make an impact on that end of the floor, as his new team ranked last in defensive efficiency for the second straight season. Bad defense starts in transition, too. Last season, only two teams allowed their opponents to take a greater percentage of their shots in the first six seconds of the shot clock than the Lakers did. And no team allowed their opponents to shoot better in the first six seconds. 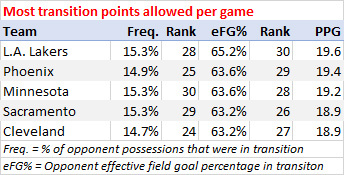 Opponent transition possessions were both frequent and efficient. The Lakers' defense has not only been at its worst early in possessions, but early in games as well. Over the last two seasons, they've allowed 841 fast break points (5.1 per game) in the first quarter, almost 100 more than any other team has allowed in any period. 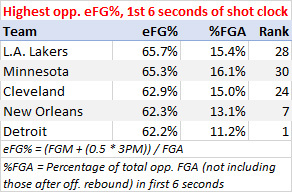 Last season, L.A. opponents had an incredible effective field goal percentage of 68.5 percent in the first six seconds of the shot clock in the first quarter, when they allowed a brutal 112.3 points per 100 possessions. The Lakers' defense has more issues than just preventing fast break points. They had the league's second highest opponent effective field goal percentage in the last 12 seconds of the shot clock last season. But if they don't want to rank in the bottom five defensively for a fifth straight season, the first thing they must do is get back in transition. Key stats to know about the Los Angeles Lakers this season. Only team that ranks in the bottom five in both offensive efficiency (26th) and defensive efficiency (30th) over the last five seasons. Saw a win increase of nine games last season after seeing a decrease in winning percentage for five straight years. Ranked last in both offensive efficiency and defensive efficiency on the road. Were the league's worst first half team, getting outscored by 9.2 points before halftime. But were one of three teams (New York and Sacramento were the others) that got better with each quarter, from a minus-10.5 NetRtg in the first to minus-3.1 in the 4th. Were 9-32 on the road, with the league's worst road offense and the league's worst road defense. One of three teams (Orlando and Philadelphia are the others) that has ranked in the bottom 10 in offensive efficiency each of the last four seasons. Took 33.5 percent of their shots from the restricted area (the eighth highest rate in the league), up from 27.8 percent the season before (third lowest rate). That was the biggest increase from 2015-16 to '16-17. 36.4 percent of their 3-point attempts were pull-ups, the highest rate in the league. And 26.6% of their 3-point attempts were contested, also the highest rate in the league. Led the league in bench scoring at 47.1 points per game. According to SportVU, they scored just 1.01 points per possession, the lowest rate in the league, when they ran a ball screen. Were the team least likely to pass when they drove, doing so just 21.6 percent of the time. Julius Randle (18.0 percent) and D'Angelo Russell (18.2 percent) both ranked in the bottom 10 in pass percentage among 119 players who drove at least 200 times last season. One of three teams (the Nuggets and Kings are the others) that have ranked in the bottom 10 in defensive efficiency each of the last four seasons. Fifth team to rank last in defensive efficiency in consecutive seasons in the 40 years since the league starting turnovers in 1977. Only team that ranked in the bottom five in opponent field goal percentage in the paint (30th) and in the bottom five in opponent effective field goal percentage from outside the paint (28th). Had the league's worst clutch defense, allowing 125.1 points per 100 possessions with the game within five points in the last five minutes. Though they had the league's worst defense on non-clutch possessions, only two teams (Charlotte and Phoenix) saw a bigger increase in DefRtg from non-clutch possessions to clutch possessions. Had the league's worst aggregate NetRtg (minus-9.3 points per 100 possessions) for players who started games. But their original starting lineup (and their most-used lineup) - D'Angelo Russell, Nick Young, Luol Deng, Julius Randle and Timofey Mozgov - outscored its opponents by 7.1 points per 100 possessions in 403 minutes together. Their second most-used lineup, an all-bench unit at the start of the season, was a plus 7.8 per 100 in 195 minutes. All other lineups were outscored by 9.7 points per 100 possessions in 3,339 minutes. Were outscored by 453 points in Randle's 2,132 minutes, making it two straight seasons that a Lakers big man (it was Roy Hibbert in 2015-16) had the worst raw-plus minus in the league. Randle had the second worst mark in '15-16. Were outscored by 13.9 points per 100 possessions with Brandon Ingram and Randle on the floor together. That was the second worst NetRtg among the 250 most-used two-man combinations in the league, but wasn't the team's worst two-man combination. They were outscored by 18.6 points per 100 possessions in 721 minutes with Jordan Clarkson & Russell on the floor together, the worst mark among L.A. combinations that played at least 500 minutes. Before Dallas traded him at the deadline, the Mavs allowed just 97.4 points per 100 possessions with Andrew Bogut on the floor and 108.5 with him off the floor. Corey Brewer took 28.5 percent of his shots in the first six seconds of the shot clock last season. That was the league's highest rate among players who attempted at least 300 total shots, and Brewer was the only player in that group with a rate more than double the league average (14.1 percent). Brewer shot 22.9 percent from 3-point range, the worst mark among 232 players with at least 100 3-point attempts. The percentage of Kentavious Caldwell-Pope's shots that have come from the restricted area have gone down each year of his career, from 30 percent in his rookie season to just 16 percent (the 10th lowest rate among 85 players who took at least 750 total shots) last season. But his effective field goal percentage (though well below the league average) has been pretty consistent over the last three years: 48.0 percent, 47.9 percent and 48.1 percent. Jordan Clarkson was one of five players with at least 200 drives and a turnover on at least 10 percent of them. Luol Deng recorded career lows in usage rate (14.3 percent), effective field goal percentage (44.7 percent) and true shooting percentage (47.0 percent) last season. His true shooting percentage was the fifth worst mark among 222 players who attempted at least 400 shots from the field. Brandon Ingram's true shooting percentage of 47.4 percent was the second worst mark among players who took at least 500 shots. Ingram led all rookies with 2,279 minutes played. He ranked among the top 10 rookies in total points (sixth), total rebounds (fourth), total assists (10th), total steals (eighth), and total blocks (fourth). Brook Lopez grabbed just 9.5 percent of available rebounds while he was on the floor, the lowest rebounding percentage among the 35 seven-footers who played at least 40 games. Lopez attempted 387 3-pointers after attempting a total of 31 through his first eight seasons in the league. His increase of 132 made threes was the second biggest (one short of Eric Gordon's 133) from 2015-16 to '16-17. Julius Randle recorded assists on 19.8 percent of his possessions, up from 11.5 percent the season before. Larry Nance Jr. assisted on 17.5 percent of his possessions, up from 10.8 percent in his rookie season. Those were the second and eighth biggest increases in assist rate among 244 players who played at least 500 minutes in 2015-16 and 1,000 in '16-17. NBA TV's Lakers preview premieres at 6:30 p.m. ET on Tuesday, Oct. 3. See the full preview schedule here.